Monin Blackcurrant (Cassis in French) syrup in stylish 70cl glass bottle. The blackcurrant berry features a sweet, lightly bitter taste and a dark colour. It is traditionally used in jams, juices, cordials, ice creams and syrups. Felix Kir, appointed mayor of Dijon, France, from 1945 to 1967 gave to this delicious flavour his letters of nobility. He popularised the famous drink called Kir made of white wine and 'creme de cassis' or 'blackcurrant liqueur' by offering it at receptions to visiting delegations. Flavour countless beverages with the natural berry taste of Monin Blackcurrant syrup! Taste: Green nose of blackcurrant bud. Rich, sweet and fruity blackcurrant taste with touch of tartness. Applications: Cocktails, sodas, smoothies, lemonades, fruit punches, teas. 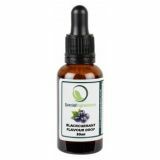 Sugar, water, concentrated blackcurrant juice and othe fruit juice, natural blackcurrant flavouring with other natural flavourings. Total fruit juice: 28% minimum, including 25% blackcurrant juice.